No Laps, Runs, or Streaks! We have stained over 2,500 fences & decks since 1995! 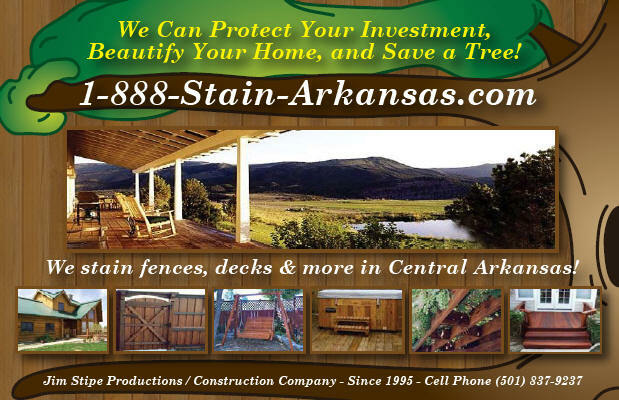 We stain/seal fences and decks for: apartments, Arkansas Razorbacks, attorneys, businesses, churches, colleges, commercial buildings, contractors, country clubs, deck builders, deck cleaning company, deck contractors, deck waterproofing companies, dentists, doctors, fence builders, fence company, fence contractors, fence repair companies, gardens, golf courses, handyman services, home builders, home improvement contractors, home inspection service, home remodeling contractors, home repair, homes for sale, hospitals, hotels, houses for sale, landscape architects, landscape contractors, landscaping companies, lawn care specialists, lawyers, master gardeners, mobile homes, new home builders, new home construction, painters, painting contractors, physicians, power washing companies, pressure washing companies, real estate agents, real estate appraisers, real estate buyers-brokers, real estate developers, real estate sellers, realtors, remodeling contractors, restaurants, schools, warehouses, waterproofing contractors and more! City of Alexander, Arkansas (AR) in Pulaski County. City of Benton, Arkansas (AR) in Saline County. City of Bryant, Arkansas (AR) in Saline County. City of East End, Arkansas (AR) in Saline County. City of England, Arkansas (AR) in Lonoke County. City of Greenbrier, Arkansas (AR) in Faulkner County. City of Heber Springs, Arkansas (AR) in Cleburne County. City of Hot Springs Village, Arkansas (AR) in Garland and Saline Counties. City of Lonoke, Arkansas (AR) in Lonoke County. City of Malvern, Arkansas (AR) in Hot Spring County. City of Mayflower, Arkansas (AR) in Faulkner County. City of Scott, Arkansas (AR) in Pulaski and Lonoke Counties. City of Sheridan, Arkansas (AR) in Grant County. City of Vilonia, Arkansas (AR) in Faulkner County.